Journals are improvisatory writing and contain errors of fact & omission. Please keep that in mind as you read. It's an ordinary day, an extraordinary trip about to begin. Documents are in order. I am sure to include McNally's Dracula Was a Woman and Penrose's The Bloody Countess, which I must review before the castle tour. When I look up close, it's the same -- bad tree cuts, pressure-treated lumber, abandoned candy wrappers, the non-stop roar of some too-near motorway. But then there are the magpies, the aggressive weed (we have it, too, but here it is filled with white blossoms below the leaves -- bulging blossoms, not faint ones), the glorious tulips, tiny lanes, and the thatch roofs all thick and carefully contoured. The walk to the Sutton Arms -- also thatched -- is about a mile. There is very solid food, including cauliflower-broccoli soup and fresh bread, venison, toffee-soaked toffee cake, coffee, and a pint each of Guinness and Adams bitters. I meet a tall local gentleman at the bar while I am trying to figure out pub ordering protocol (which is, I find, to order everything, including food, at the bar and put it on a tab). He hears my accent and asks why I am here. I tell him about castles and Erzsébet and documentaries, and he repeats the tale to his table. In a few minutes I am called upon to verify his story. Bar bets exist everywhere. The meal is finished, the bitters are drunk, and I stroll slowly back to Pynchon Hall. I am housed in the highest room in Pynchon Hall, a genuine Tudor mansion that is otherwise appointed with an unsettling mix of old and new furniture (all of it odd), new but flimsy bath fixtures, stylistically mismatched lamps, a variety of televisions, no clocks, and only instant coffee. Among the discongruities, only the coffee is iniquitous. The next morning (or rather, later that morning) we pile into the van and drive to the airport. Check-in is easier than I might have anticipated, considering the dozen travel cases full of camera equipment, dangerous-looking explosive-shaped black batteries, a smoke generator, and three torches (yes, the wood-and-animal-fat kind). After a quick hour (with me continuing to review the Báthory facts in the McNally and Penrose books), we descend into Vienna over farm terrain as tidy as I recall the city to be. The driver is waiting for us after we pass through customs. We load into his Fiat rental van and head toward the Slovak border at Berg/Bratislava. Tidiness surrounds us. The passkontroll stop is uneventful, but then we encounter a bureaucratic crisis. Our equipment, they appear to say (though it is unclear as the driver speaks no English whatsoever), needs to be heavily bonded. Mobile phones appear from the pockets of the camera crew. Calls are made: Embassies (alas, it is a Bank Holiday in the U.K.), the studios, ambassadors -- anyone who might help out. Each member of the crew disappears in turn into back offices and returns. Our translator is contacted in Cachtice, and helps create, after a fashion, a conversation involving a pantomime of exchanged phones. Finally, a staffer doing double duty at the U.K. embassy discovers we are using the wrong from of carnet, a European Union pre-membership manifest that was to have been duplicated and stamped by the Chamber of Commerce in both countries. Mobile phone batteries are draining as we begin a third hour of calling and waiting, surrounded by heavy trucks and even heavier border guards. The bond is to be two million Slovak crowns -- about £40,000 ... and is to be posted to studio credit card. The director (who stays in the van after the border guards ignore her authority, refusing to accept a woman as spokesperson for the television crew) refuses the request, believing the money and the valuable card number will vanish forever into the underworld. At last a fax comes alive in the office. The embassy staffer has come through and the manifest authorizations are peeling off the roll. We are stamped many times, and ordered to go immediately to a business office in Bratislava, which gives approvals to return back across the border with our equipment. Three hours late, we drive onto the expressway in Bratislava, heading toward Cachtice. The town appears quickly, just an hour out of Bratislava on the new motorways that have been built since our trek there in 1992. Like Prague, the Slovak towns are blossoming with flowers everywhere, as well as new paint and renewed energy and enthusiasm for projects and life itself. We stop briefly at the town hall for an introduction to the mayor, Anna Ištoková (who plans to join us the next day during the castle filming), then go to the local restaurant -- the same one, serving the same soup that we had nearly ten years ago, but this time it is followed by filets of pork with gravy, rice, and cabbage salad. We haven't ordered; everything is ready for us, unbidden. Following the hefty lunch is Turkish coffee (a traditional Slovak drink, and a heritage of Süleyman's invasions four centuries earlier). Naturally, I pluck several pastries from the case before leaving. Mark heads for the bank, the rest of us to our accommodations on Cachtice's main street (past the graveyard). The mistress and her two small children greet us, all of them plump and friendly. The accommodations are typically eastern European -- spare and collective. The Brits, however, are horrified at the idea of sharing two beds (even at £15 a night for all four of us, including breakfast), so everything -- mattresses, cushions, and pillows -- are split up into various uncomfortable segments. We then carry equipment and bags inside, and settle in ... briefly. We want to scout out the castle for general view shots, so we locate the road (no longer inconspicuous as it leads out of a tile and brick town green and square) to the castle. The fact that there is a castle is resoundingly unnoted. First we walk along the town square and film commentary; it's going badly as it's impossible to keep the sound of vehicles out of my microphone, and I'm having trouble picking up the story after every stop. Just as the story is sorting out, the owner of one of the houses we're filming near comes out to chase us away. We're without a translator, and by the time the translator gets there, it appears my guess is right -- too many years of informers have made townsfolk suspicious of people with cameras. We leave. We return to the van, turn toward the castle, and drive along a narrow road past a dwindling neighborhood into farm country. The paved road falls of to dirt, and fields of rye open up to the southeast. The dirt road shrinks further to a rutted path. The first view of Cséjthe Castle is an unmitigated thrill. 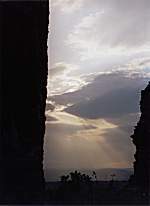 The fortress, bathed in bright sun, is etched almost two-dimensionally against a pale, nearly cloudless sky. We are ready to shoot in minutes, and the director acknowledges it as the most beautiful and mysterious castle she has seen in the weeks of creating their television series, and shortly she is talking about the possibility of doing an entire show at Cséjthe Castle. I give a quick tour around the main areas, and shots are set up overlooking the town and fields below. The others arrive during the session, and the afternoon lengthens, as do the shadows and the sense of deep history. I call my wife from the castle, a moment of wonder that we share across geography and time. We work until nearly dusk, and return to our flat. The mistress brings out coffees (Turkish again), and glasses of local slivovica, a plum brandy. Leading us in the tradition, she lifts her glass in a toast (nazdarove), and downs the strong, clear alcohol in one gulp. We try, and all stagger; it takes me two tries -- but the second glass is easier. It is soon time for dinner. We are scooped us into two vehicles, and off we go to neighboring town of Nové Mesto, to a lovely restaurant of dark wood, beautiful glass lamps, and tiled floors. Beer (pivo) arrives in profusion; we scan the menus for clues to the offerings, and find German equivalents of the opaque Slovak. I order a mayonnaise-based cabbage salad (zelery šalat), fried farmer's cheese, small white potatoes, green salad, and beans. I'm so hungry that I don't notice what others are ordering, but when the food arrives, the sharing ensues -- lots of meat, salmon, other salads, and varieties of vegetables. It is marvelous. More beer follows, with plenty of conversation. Our translator is emigrating to Toronto, the cameraman is saving for more equipment -- he's a freelancer and everything he's bought for the shoot is his own -- the researcher is still in somewhat of a state of awe over the castle, and the director is thinking ahead. And there's more beer ... and coffee, and a luscious dessert: palacinky with apricot marmalade. We talk until the restaurant closes around us, returning to our flat for even more conversation. It doesn't last; I fall asleep in seconds, with hardly time to dream before it is morning of the full shooting day. And it is raining. Each of us has a short shower; I take an extra few minutes' nap, so I shower after everyone else -- and the water is ice cold by then. Things are looking unpleasant, especially as a heaping breakfast of coffee and scrambled eggs is served. I stick with the coffee; nausea trumps politeness this time. The rain ends before we pack the van, the clouds break up, and morning sun brightens the landscape -- so much the better, as the first segment is filmed with me walking across a field of glistening rye. I now see what is being planned; I'm afraid this will be a true 'slow-talker' program of the type I abhor. Perhaps, if things go very well, it will be cut into something more dramatic. We will see, but I am not optimistic. More scenes are filmed of me walking -- up the pavement; up the dirt road; up the rutted path; through the gate. The sun has come out fully, and even at eight in the morning, it is getting hot; Will has stripped off his shirt. I'm wearing long-sleeved black for effect. It will be an equally long day. We arrive at the castle, but with all the starting and stopping for preliminary takes, I am beginning to lose the sense of excitement and wonder I felt upon first seeing the hrad. I work to clear the presence of the film crew out of my mind, turning myself inward and thinking of it as merely a long stroll uphill with friends to show around. I fool myself adequately, and the constant re-takes become less intrusive. I decide not to recreate my description or retrieve my thought each time (not that I could), instead telling the story in a slightly different way. Their job is editing, so I'll let them do the work of creating coherency out of what are to be a many hours of raw tape. I tell tales of power, of cruelty, of love and marriage and war, of the Renaissance, and of three religions and three cultures and three languages. The story of Erzsébet's childhood and privilege come to light, of her witness of persecution, of her servants and lovers and relatives, and most of all, of her madness. We walk to the windows, into tunnels, through passages, over parapets. Eventually we film a long scene inside the death tower itself. I work to become breathless; Will circles faster and faster with his camera inside the high, narrow tower. Over and over I tell the stories of women frozen in the snow, thrown from the ramparts, pierced by iron maidens, burned by glowing coins, and torn apart by Erzsébet herself. Throughout, I try to keep personal and involved, neither theatrical nor melodramatic. (It does not help that the director continues to ask off-camera questions about 'how you feel'). At one point the researcher comments, "Americans are natural historians -- they are the best storytellers." We move from inside the tower to the middle of it, looking up to where ravens call to each other as the mother stays with the fledglings in the nest. It is also a holiday in Slovakia -- and across most of Europe -- and families are making their way to the castle for picnics. We exchange a dobrý den with everyone, and the occasional prosím as we try to set up shots to make it appear that we are alone. I describe Erzsébet's trial, imprisonment, and death as birds tend above and children play below. We break at last for lunch, and mayor Ištoková is there with the city officials, including the cellarmaster for the winery. All are at last gathered for lunch. I have been taking photographs all day, and video as well. Occasionally someone picks up my camera to put me in the scene, and I try to catch them doing their work in a context that explains the process and reveals the physical proportion between crew and castle. There are more toasts of sparkling water and a local cola that is strengthened by the sulphur in the water (the legendary hot springs of Pieštany, where from Erzsébet's time to this day people travel for the cure, are only 20 km south), and we enjoy baguettes of local ham, cheese, and pickles. I suggest to the mayor that perhaps she might welcome the premiere production of my opera Erzsébet at Castle Cachtice, perhaps with the Bratislava Symphony Orchestra, perhaps with local extras. Perhaps? I have a certain hesitation, as the town might not be interested in the full re-awakening of this story. She dismisses my hesitation and welcomes the idea -- the westernization of Slovakia has brought with it an interest in tourism that dispels ghosts with the image of crowds visiting the ancient town. If the opera is premiered, then, it will be at Castle Cachtice. Eventually the mayor and her associates leave, but not before arranging a tour of the cellars below Erzsébet's erstwhile mansion in the village to be followed, of course, by a formal reception at the town hall. Behind us the blazing sun is now being veiled in thin clouds, then thicker ones, and soon a storm is passing to the north, complete with thunder and jagged lightning. Will captures it. Almost enough material has been recorded as we move toward late afternoon, but still we must visit the forbidding forest that begins below the ramparts, the forest of primeval creatures and wood-gods that formed Erzsébet's early pagan education, before she balanced Lutheran and Muslim in a triptych of curious and conflicting worship. We take the path downward into the darkness, and Will creates the precipitous sensation of the high fortress walls as well as the point of view of a young maiden falling to her doom among the wolves that frequented the farmland outside Castle Cséjthe's gates. The castle filming is complete. All the stories have been told over and over, including an introduction to the creation of my opera Erzsébet. I have time to wander alone as equipment is packed. Castle Cséjthe is different this time, I think. It isn't the brightness, nor the palely pure color, nor even the fact that I had been there before. It is, instead, the perfection of normalcy, the opposite of the insane, the depraved, the cruel, and the evil. It is cleansed of blood as Erzsébet's chambermaids could never do. There is no longer the whiteness of bone, but the whiteness of a true, unstained purity. I think of the girls playing and giggling and flirting in the tower; they are both charming and disconcerting. They are Slovak. They are of the age that Erzsébet sought girls to torture and send to anonymous deaths. It is as if they have come to Castle Cachtice to exorcise, by their careless and innocent joyfulness, the spirit of the aging, insane countess. It is time to go back into town for the final evening -- however, the day is anything but over. In the new town square, an old man is reading a V-E Day speech to the villagers. A band awaits to play music among the most awful ever heard ... drum, bugle, accordion, and saxophone appear to have no relationship to each other. Perhaps it is caused by the near-empty bottle of wine sitting next to their instrument cases. I am sorry not to be carrying my recording equipment. We would like to take some shots inside the Cachtice town museum, the one that was closed when we visited nine years ago. The Múzeum is far more than I expect. The classic 19th century portrait of Erzsébet is there, but also 19th century engravings and -- something I am seeking! -- the 17th century copy of the original painting that shows her without the romantic viewpoint of artists 250 years after her death. Her eyes are bigger, unfocused, and stare apart. Her ears are large and her skin sallow. The painting reveals an artificial quality, even though she is but a 25-year-old countess. 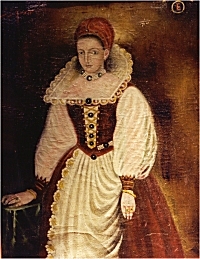 There are her marriage certificate, engravings of her husband Ferenc and son Pál, and her last will and testament, signed, and dated 1614, and written during the last days of her two-year imprisonment in Castle Cséjthe. And novels, both serious and trashy, are heaped in the display cases. There is von Elsberg's classic German biography, and the pulp series Stories from Cséjthe, as well as a publication of the Latin documents of her 1611 trial. Fragments of the castle's hearth are there, along with a few remaining metal shackles and instruments of torture. On the walls are photographs of the castle from 150 years ago, an engraving of an imaginary and unproportioned re-construction of the original (with the tall, peaked roofs), and an astounding charcoal drawing of how the town of Cachtice would like to rebuild the castle -- smaller and tighter, but with the death tower intact -- someday, should it be possible. In one case are spurs for the Hungarian soldiers; on the walls all around are family crests that have become so familiar in retelling the frightening stories. Behind glass is the intimidating herald of three dragons teeth surrounded by the coiled, winged serpent that represented the Ecsed branch of the Báthory family. Missing are the original portrait from 1585 (which was spirited away, says the curator, probably to Nagyecsed, in the mid-1990s), any records of Erzsébet's victims, and the iron maiden that she kept in the townhouse. Most likely all were lost when the castle was burned by the French in the early 1800s, leaving the fortress in its present ruined state. The camera records slow scans of the engravings, paintings, and documents. Something about the museum -- where Slovaks celebrate their own torturer and enslaver -- is sobering. We walk out, past the now-empty town square. Cachtice's historian Vladimír Ammer is awaiting us at Erzsébet's town mansion, or at least at the winery that now stands on the site. Ammer is almost an apologist, whether it is for Erzsébet or for the village that allowed her to live among them. George translates. No, there was no torture in the mansion basement (though documents reveal there was); no, she was not evil, only sick; no, she was never feared or hated, only pitied. The old man can be forgiven, for he clearly lived through a modern sort of oppression during the Communist era, and knows how to please his interlocutors. The cellars actually show no evidence of Erzsébet. Though remnants of the old walls are visible at the property's edge, the cellars themselves have been rebuilt from what appears to be 19th century brick. Tunnels -- the ones which held the decaying remains of so many young girls -- are long gone, or at least sealed. The cellars are silent, and we all (the crew, the mayor, the council, and I) gather instead to drink wine together from the black casks of Cachtice. The researcher gives a lovely speech of appreciation toward the people of Cachtice for our welcome, and we conclude with several toasts drawn directly from the casks. Working with the television crew is pleasant and efficient, and I've enjoyed it; I think the feeling is reciprocal. I've tried not to make assumptions about what should be happening, and they haven't been reluctant to let me follow a story through to its conclusion. If anything is tiring, it is not the dozens of climbs up and down the castle grounds, but rather the number of times I am asked how I 'feel' about a place or an event. They believe Americans want to hear feelings before facts (the director is especially convinced of this). My feelings are personal enough that they would seem irrelevant if not entirely bewildering, so I invent occasional quasi-philosophical appropriatenesses and look convincingly (I hope) directly at the interviewer. It has already been nearly a 12-hour day, but there is more. We jump into the van with the driver and the cellarmaster, destined for Višnové, 5 km distant and the town that is visible from the walls of Castle Cachtice. We pass a husband and wife -- she with a cart of plants, he with a scythe -- and Will stops to film them. They nod and continue on their way with a lovely, relaxed gait. Višnové provides a stunning view of the castle in late afternoon sun. The crew heads down a garden wall to the river, and is joined by a man who may or may not be objecting to their presence. He mostly seems to be telling stories, unaware that the pair speaks no Slovak. The three of us watch from the bridge. At the town hall, a reception is given in our honor. The table has lovely local bread spread with pâté and fresh scallions and (oddly) a plate of stale potato chips. We all enjoy the food. There are gifts for us -- Ammer's history of Cachtice, a historical CD-ROM (technology has indeed arrived), some trinkets, two bottles of local wine, and slivovica. We have come to Cachtice unprepared for the welcome we would receive (we are, after all, only a film crew). All I can do (having been given a hint that presentations would be taking place) is slip off before the reception to the flat to retrieve copies of my CD to present to mayor Ištoková, historian Ammer, the cellarmaster, and the council. I ask our translator -- who has marvelously provided near simultaneous translation for the past several hours -- to explain that the CD was the first version of a composition eventually premiered in Prague. They are delighted not only to have a mutual presentation, but also to know that there was already a bit of cultural bond between us that did not depend on the Blood Countess. Interestingly, it is again time for dinner. The same restaurant is chosen in Nové Mesto, and more pivo in great glasses arrives, followed by a dinner of salad, chicken with asparagus, and another apricot palacinky. Conversation is long, and turns to art, politics, and history. The evening fades (the restaurant closing once more around us), and we return to our flat at #33. It's not long before morning comes again. The mistress has prepared coffee and packaged some sandwiches. Now devoid of souvenirs, I use my dictionary to ask the mistress to give each of her children some of my American and English coins to play with. At first she objects, but finally I make it clear these are trinkets for the children ("Ano, ano! K díte, k dáte," I implore, holding my hand at my knees to reinforce the idea of their height, until she understands my pitiful attempt at Slovak), and she is delighted. The shower is cold again -- even though I was second in line this time. Others pass. We pack up and bid farewell to the mistress and the children. It is too fast a trip to Bratislava. The border guards take our carnet and wave us through. The Austrians barely give us a glance as we enter the country of the tidy lawns. After waiting around the airport in Vienna attempting to be interested in the shops (even Mozart chocolates seem dull), we fly back to Stansted, and part company at Pynchon Hall. The cameraman has turned over the tapes and is headed for his flat, the researcher to the studios, and the director to a film festival. A huge storm system sweeps through southern England, including Bishop's Stortford, downing trees and cutting off power. It is lovely, a fine farewell indeed.